Isaac is a young pastor in Rwanda who has a passion for educating and caring for vulnerable children with disabilities. Pastor Isaac greeted us, an Orphan Care PEACE trip team of men from Saddleback, with his infectious bright smile, he graciously showed us the Presbyterian church that he pastors, and the adjoined school for disabled children that he started as a ministry of his church. He was unashamed to share that although he does not have much experience with disabled children, he knows he has been appointed by God to help them. Isaac walks by faith in obedience to Christ, ministering to his community in a very real and powerful way. He has a vision to grow the school, to expand the hours, and to be able to offer more help for disabled children who come with all sorts of special physical and mental needs. We followed Isaac down the red dirt roads in the community he serves, and he led us to a very small residence. We were welcomed inside a dark, small living room that was lined with a small couch, a few chairs, and a wheelchair that sat in the corner. This is home to a young mother and her two children, ages 11 and 7. This brave young woman welcomed 8 strangers from this PEACE team into her humble living room and began to share her life story. Brave and vulnerable, this young woman did not hesitate to share her story of pain, fear, poverty, rejection, desperation, and the hope that the local church now gives her. This young mother became pregnant as a teenager and gave birth to a disabled son who did not make a sound for the first 3 months of his life. As a teenage mother, she remained in the hospital with her newborn son for 3 months, without work and without support. Miraculously, an anonymous person paid for her very costly medical fees and she was released from the hospital with her son. Not willing to bear the burden of raising a disabled son, her husband left her to raise her son alone. This caused her to take extreme measures in order to provide for her family. She admits to having to lock her son in a room so that she could go find work. While her son was caged, she would sell drugs in desperation to earn money. Four years later, she gave birth to her second son and continued to sell drugs. Eventually, she was arrested and was sent to prison along with both her sons. Once released from prison, she would continue to lock her children up so that she could go find work. Prostitution eventually became the way that she would make ends meet. A life of prostitution led to fear, anger, and shame, but it was the only way she knew how to provide for herself and her children. She was hopeless, yet she desperately fought to survive. Pastor Isaac and his church learned of this situation and wanted to offer this family real lasting hope. Pastor Isaac invited this young woman and her children to his church. Through the support of the orphan care sponsorship program, Isaac was able to come alongside this struggling family, and the funds enabled her son to enroll in the school for disabled children. The church is also able to make sure that this young mother has her basic needs met so that this family will remain intact. Church volunteers help teach her how to care for her children. Without hope, many families abandon their children, leaving them as orphans; but the local church offers hope. The church works with families in order to prevent anyone from becoming an orphan. As the local church rises up, encourages, and helps support struggling families, many children (especially disabled children) are able to remain in their family of origin. Making sure that children remain in their family origin is a key strategy of the Orphan Care Initiative. This young mother can now be a mother to her children, she has hope, and her disabled son has recently been able to learn to sing and is learning to write! Praise God! The church in action brings amazing hope, transformation, and healing. This family is now tangibly receiving physical, spiritual, and emotional support. Through generous giving and sponsorship, the PEACE plan partnering with the local church is truly able to be the hands and feet of Jesus to those desperately in need. Your sponsorship is offering hope to the hopeless and is helping to transform and heal some of the most vulnerable and broken lives in our world. Pastor Isaac’s church and this family are eternally grateful, their spirits are hopeful, and they sincerely offer their love and thanks as they are encouraged by your support. If you would like to serve churches like this one in Rwanda on an Orphan Care PEACE trip, email orphans@saddleback.com. If you would like to support an adoptive family in Rwanda through Sponsorship, check out http://www.saddleback.com/Sponsorship. Victory Family Church sits on a hill with a gorgeous view of the Kamonyi District in Rwanda. The church property was once an orphanage, but all the orphans who recently lived there have graciously been adopted into local families. Victory Family Church now uses the church property not only as a church, but also as a vocational school that teaches sewing and hairdressing skills as a ministry of the church. Although the orphanage closed quickly and children returned to family, most families in this area who have adopted children are in need of parental training and emotional from the church. Seeing the immense difference that church support provides family, the government specifically asked the Orphan Care Initiative to come alongside these fragile new families with tools and training. 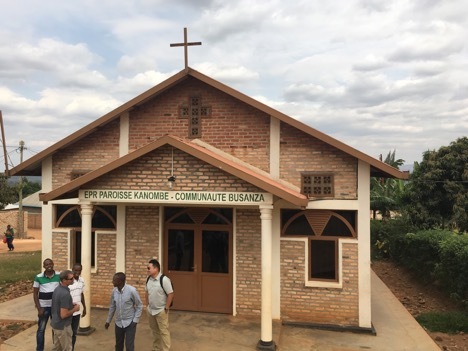 This past June, a PEACE team from Saddleback Church had the privilege of leading a parent training seminar at this wonderful church in Rwanda. As most people living in this community rely on walking as their most common mode of transportation, it took a couple of hours for the local parents to eventually arrive on foot. 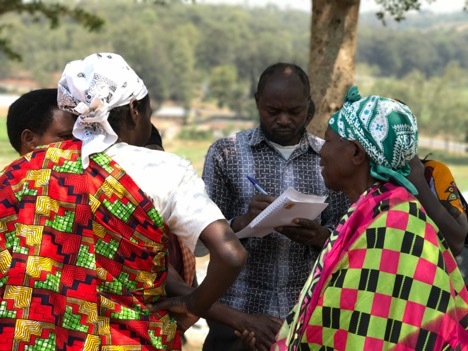 The attendees consisted of a few men and approximately 20 local Rwandan women who were beautifully dressed in their bright colorful patterned dresses. Prior to the start of the parenting seminar, a few of the colorfully dressed women led the entire sanctuary of visiting Americans and local Rwandans in joyful singing of praise, worship, and dancing to the Lord. “With God, anything is possible” is what was passionately being sung to the Lord in their local Kinyarwanda language that was accompanied by a beating drum, clapping hands, joyful shouts, and joyful dancing. The PEACE team invested hours encouraging and training the attentive Rwandan parents who have all adopted children into their families. Most of these parents expressed that they have adopted not just one child, but multiple children into their families. Many of their adopted children are now teenagers, bringing new challenges to the family dynamic. The team taught the importance of patient and gentle discipline, facts concerning brain development, emotional attachment, and Trust-Based Relational Intervention (TBRI training). Although their spirits are willing, their flesh is often weak. These wonderful parents needed to be strengthened. And this day they were. The Rwandan parents filled pages of notes as they listened attentively and later expressed how thankful they were for what they described as an invaluable and inspiring seminar. They expressed that they were immediately motivated to start a support group of their own in order to encourage one another. The long-term mission strategy for Orphan Care was set in motion that day as that special group of faithful believers left encouraged and inspired. 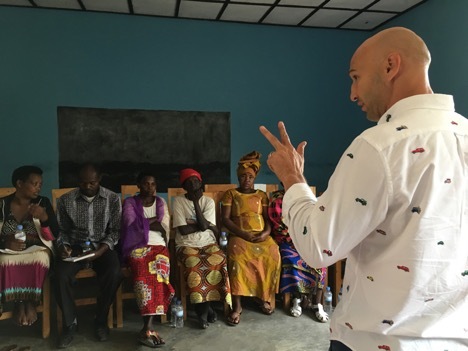 The visiting PEACE team was able to minister through their acquired knowledge, education, and experience that was shared through the love and grace of Jesus Christ. And this visiting PEACE team was equally encouraged by the Rwandan parents who were so filled with the joy of the Lord as they were living out their purpose as compassionate, selfless servants of Jesus Christ. The local Rwandan parents invited the team to return again as soon as possible as they were eager to continue to learn as much, and as often as they could. Thankful goodbyes were exchanged, and with their arms raised towards heaven and hands waving, they shouted, Imana Ishimwe! Praise God! If you would like to serve churches like this one in Rwanda on an Orphan Care PEACE trip, email orphans@saddleback.com. If you would like to support an adoptive family in Rwanda through Sponsorship, check out www.Saddleback.com/Sponsorship. Just a few miles outside of Kigali, the capital city of Rwanda, is a humble community of low-income residents who work very hard to make ends meet. This community may not be in the slums, but here things such as motorized transportation and electricity are considered luxuries. Those living here labor to ensure that they have the basic necessities for life - daily meals, clothing, and shelter. The humble homes in this hillside community are spaced at random along the dirt roads - small rectangle residences that consist of concrete walls and floors, shielded by a tin roof. Many children living in this community are able to go to school, but this too is a luxury in Rwanda. For those families who live with the additional challenge of raising a child with severe disabilities, the specialized schooling and specialized medical attention required can feel dauntingly beyond any financial capabilities that these families can afford. Living in this community is a young couple raising five children. Two of their grade school aged children are twins. One twin attends the local primary school, but the other twin is not able to because she was born with a spinal cord disability that prohibits her from being able to walk. As is the case with many high-risk twin pregnancies, one twin will often be more dominant while the other will struggle to grow and survive. Such was the case with this young mother’s pregnancy, and although both her twins survived her emergency C-section, one of her daughters was confined to an incubator for many months after her birth due to hindered in-utero development, coupled with complications at birth. This young family has faced difficult challenges, but they beam with hope as they have built their family on the firm foundation of Jesus Christ. Their faith is strong, they look forward to their eternal inheritance in heaven, but their daily struggle of raising a disabled daughter is burdensome. A recent PEACE trip team was invited into this young couple’s home to hear their story firsthand. These hopeful parents expressed their dream of being able to one day see their daughter healed, able to walk, and able to work. The PEACE team, consisting of eight Saddleback men, had the privilege of laying hands on this couple and prayed for their daughters healing and future success as a child of God. As this family continues to trust God, they are able to receive much needed support through their local church. Through the Rwanda Orphan Care Sponsorship program, the local church is able to tangibly help this family, providing them means to pay the school fees for her to attend a special church-run school for disabled children, enroll her in medical insurance, and learn skills for financial health through a savings group. The local church is able to offer this precious girl hope and is able to be a bright light to this entire Rwandan community. As the local church is able to offer support to discouraged families, the church plays a key role in ensuring that orphanages remain empty in Rwanda. Many families are tempted to give up and are even tempted to abandon their children as they struggle to find hope and purpose. However, the local church, through the support of the Sponsorship program, is able to help ensure that families remain full of hope and purpose, that they remain intact, and that whenever possible, children are raised by their family of origin. As families are strengthened and learn that they can survive together, they are able to offer the same hope and encouragement to other families in their communities. Communities are being transformed! Faith is being strengthened! Christ is at the center, and hope is alive! If you would like to help vulnerable families like these continue to support their children, check out the Rwanda Orphan Care Sponsorship program at www.Saddleback.com/Sponsorship, or call the Orphan Care Initiative at 949-609-8555.